Word left out? In the second box, “of” seems to be needed between “mistreatment” and “its”. No? 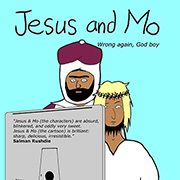 Does Mo know what platform Jesus stands upon? Author, you are elsewise. Be sure to wear your flak vest and helmet today. What a fine start for my week; I’m so encouraged maybe I’ll make a pass at my nurse. 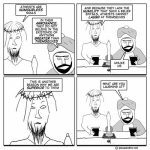 Jesus is big on the Koran; who knew? 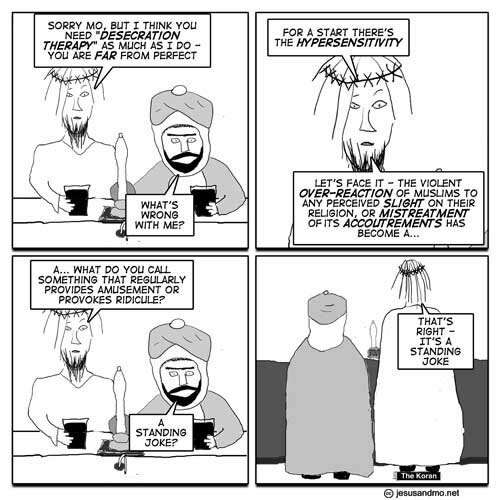 Jesus and mo is the best cartoon ever!! Where’s Barmaid?!? I’m so pissed at Author. So, you’re saying the bottom line requirement for the barmaid is a pulse? Or, body temperature above ambient? Methinks that sets the bar a little low. Oh, Jerry Jerry Jerry, so jaded. She has to be smart and uppity. For myself, I think of the young Lauren Bacall. Oooooh. Young Bacall. Now, that’s a scripture in which I could believe. Mo should be dunking a cracker in his beer. Jesus drown? Consider that he’d be walking on the beer’s foam. Of course there a danger element from those holes in his feet. Shouldn’t that read “the perceived over-reaction by some Muslims….”????? After all, just because you see it as an over-reaction, doesn’t mean they do (or should) and doesn’t make you right. I can’t see how that could be thought a reasonable reaction. So I just had to come here for a dose of reality. Ah another religion bashing site. I like the earlier cartoons, but ones like this make me wonder what the lack in belief is all about. I wonder what the need for belief is all about. There’s no need. I like believing, and I like myself liking believing. Peace. Tom proves it: religious belief is all in your head! Everyone is welcome to join reality. Open invitation. bring a friend! Jerry w, the answer is obvious … superglue! Once again the mighty deity gives the gift of knowledge to Science and Man to benefit its hybrid zombie son. Fenchurch, “… bring a friend …”. Sorry, can’t, all of mine were imaginary and they all buggered off years ago because they don’t like me much. Possibly with good reason. Poor me, deserted even by his imaginary friends. This must be what being an apostate feel like.